Don’t let the name of this tropical fruit drive you away. According to many those who have already tried it, soursop actually has a unique and interesting flavor — something that’s like a merry mix of pineapples, strawberries and a bunch of other tarty fruits. Here’s one more reason why you should embrace soursop in your life: it offers so many health benefits! Read on to know some of the wonderful things that soursop can bring into your life. One of the most amazing and well-known health benefits of soursop is its powerful cancer-fighting ability. It is said that eating this tropical fruit is several times better than chemotherapy. The nicest thing about it is it does not yield the usual side effects of chemotherapy such as nausea, weight loss and hair fall. Because it is juicy and pulpy, it’s quite evident that soursop is beneficial for the digestive system. It is packed with fiber and water that helps promote regular bowel movement, allowing waste products and toxins to be flushed out effectively. The addition of soursop to the diet is a simple and delectable way to prevent constipation. If you’re suffering from diarrhea, it’s a great idea to consume sufficient amounts of soursop. It has antibacterial properties that kill off diarrhea-causing microbes in the gut. Soursop is also rich in water so it helps prevent dehydration, a common complication of uncontrolled diarrhea. Eating fruits loaded with fiber and water is also good if you’re trying to lose weight. Doing so makes you feel full right away so you don’t end up overeating. A cup of soursop only contains 148 calories and less than a gram of fat. 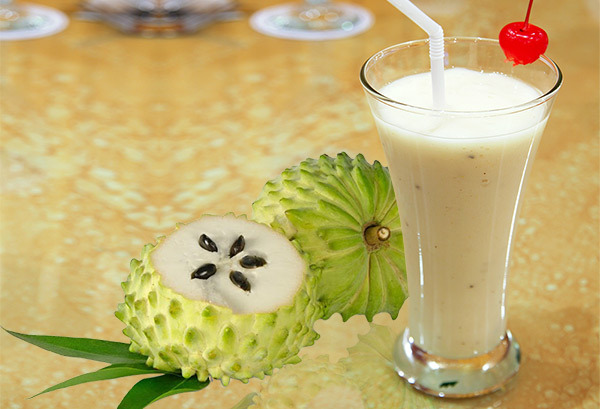 Soursop is great eaten as is or added to smoothies to make them richer, tastier and more nutritious. There are 31.5 milligrams of calcium and 60.8 milligrams of phosphorous in a 1-cup serving of soursop. Both minerals are vital for strengthening the bones and preventing osteoporosis. As everyone knows, calcium makes the bone denser and harder. The role of phosphorous is to augment the bone-strengthening properties of calcium. Eating a cup of soursop provides as much as 77 percent of your daily requirement of vitamin C. This nutrient has powerful antioxidant properties that neutralize excess free radicals before they damage healthy cells. Free radical-damage is associated with accelerated aging of the skin, causing wrinkles and fine lines to show up prematurely. Soursop contains zinc, iron, copper and selenium — minerals that help strengthen the immune system, your body’s defense against invading bacteria, viruses and parasites. This delightfully tasty and juicy tropical fruit also contains good amounts of immune-boosting antioxidants such as vitamins A, C and E.
According to studies, the consumption of soursop juice is beneficial as it can cure an assortment of health problems. Some of them include urinary tract infection (UTI), hematuria (presence of blood in the urine) and liver diseases. Drinking soursop leaves boiled in water is also known to be effective against joint pain, gallbladder diseases and cancer. - What Banana Color is Best for Weight Loss?